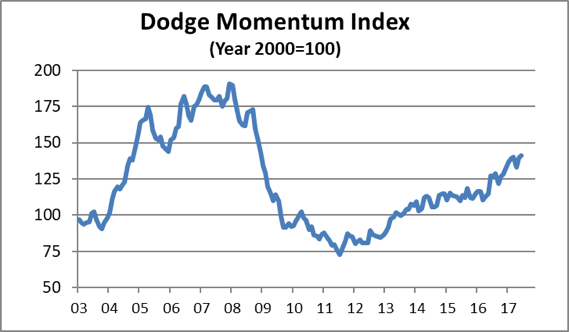 The Dodge Momentum Index took another step forward in June, increasing 1.1% to 141.1 (2000=100) from its revised May reading of 139.6. The Momentum Index is a monthly measure of the first (or initial) report for nonresidential building projects in planning, which have been shown to lead construction spending for nonresidential buildings by a full year. June’s lift was due to a 4.8% advance by the institutional component of the Momentum Index, while the commercial component fell 1.3%. The Momentum Index has exhibited substantial strength since mid-2016, with the institutional and commercial components trading off as the driver of growth almost on a month-to-month basis. Although the commercial component of the Momentum Index declined in the latest month it is 11.8% higher than it was in June 2016, while the institutional component is 9.5% above a year ago. The overall rising trend for both sectors continues to suggest that construction activity will remain healthy through the end of the year. 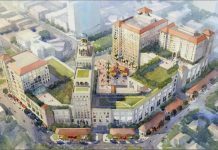 In June, seven projects entered planning each with a value of $100 million or more. 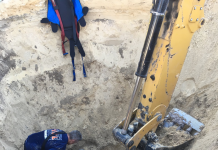 For the institutional building sector, the leading projects were the $150 million Legacy Sports Complex in Glendale AZ and the $100 million Highmark Health Cancer Facility in Pittsburgh PA. The leading commercial building projects were the $300 million Palace Station Hotel in Las Vegas NV and a $200 million office/warehouse building in American Canyon CA. 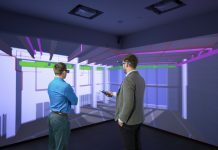 New technologies: How will they redefine the architectural, engineering and construction community?